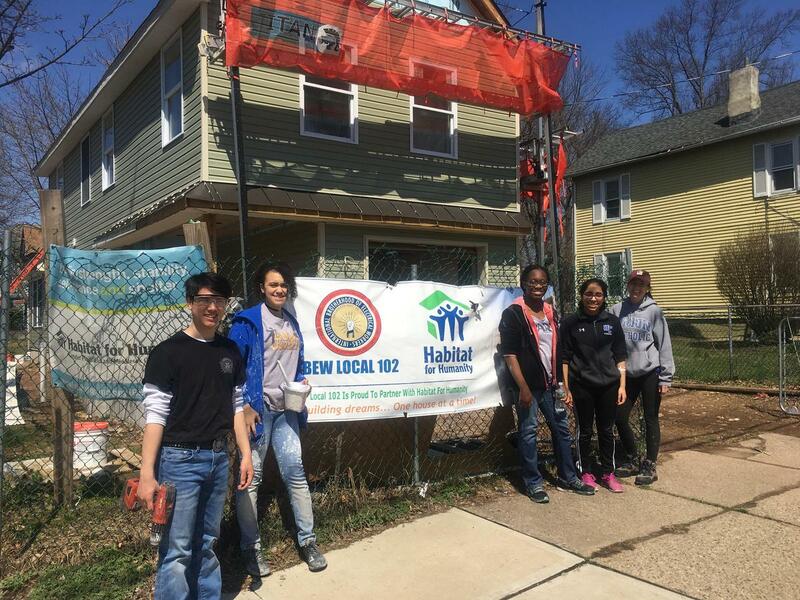 Union Catholic continued its commitment to help the community when a group of students volunteered with Habitat for Humanity to assist in the construction of a house in Plainfield last Saturday. Habitat for Humanity is a global nonprofit housing organization working in local communities across all 50 states in the U.S. and in approximately 70 countries. Habitat’s vision is of a world where everyone has a decent place to live, and Habitat works toward its vision by building strength, stability and self-reliance in partnership with families in need of decent and affordable housing. UC students Kiana Salmon, Preeti Shukla, Mia Schutz, and Kai Chiang, and Mrs. Jennifer Dixon, the Director of School Counseling at Union Catholic, joined with students from Rutgers University and the future homeowner on the project. Salmon said it felt great to help. Schutz said building and painting fit her skill set. Chiang is grateful that Mrs. Dixon told him about the chance to help. Mrs. Dixon said Union Catholic hopes to do more volunteer work with Habitat for Humanity and other similar groups.